Rhyhorn in game: 5,336 Who? Important notice! Pokemon Rhyhorn is a fictional character of humans. 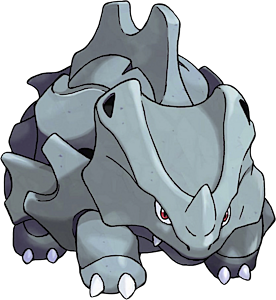 Rhyhorn is a rhinoceros-like creature with a body covered in gray, rocky plates. Its underside and rear are smooth, and it has four short legs with two claws on each foot. It has a triangular head with narrow, red eyes, two fangs protruding from its upper jaw, and small, triangular openings on the upper sides. A spiked ridge runs along its back, and it has a single short horn on the tip of its snout. The female has a shorter horn than the male. In addition to its rocky hide, its bones are a thousand times harder than human bones. 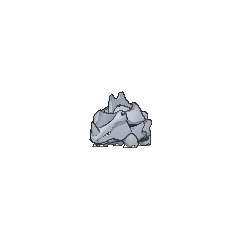 Rhyhorn's brain is very small, giving it a one-track mind. When it runs, it forgets why it started and continues until it falls asleep. However, it may recall the reason upon demolishing something. 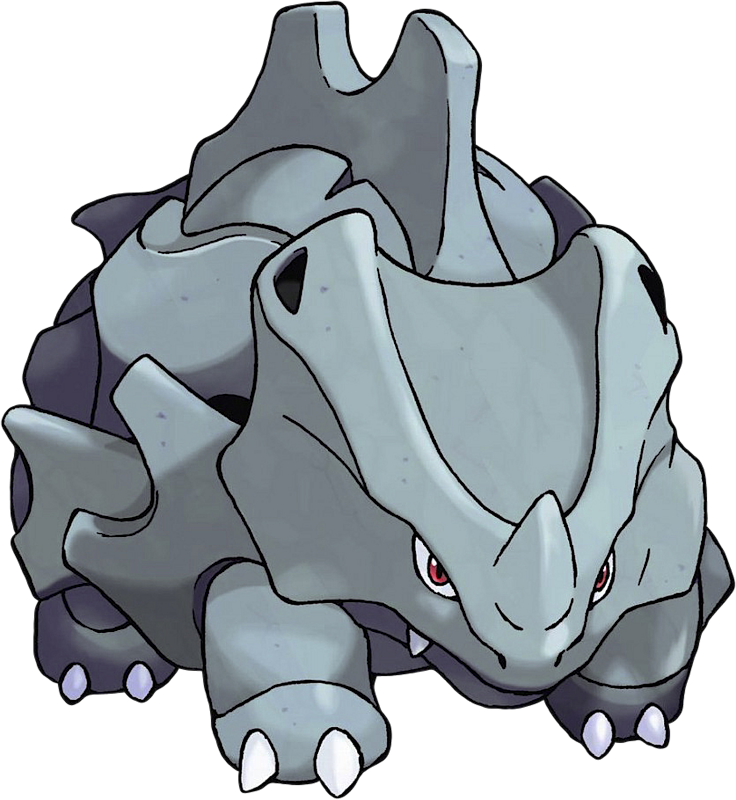 Rhyhorn runs in a straight line due to its short legs making it inept at turning. It does not care if obstacles get in the way, merely smashing through them or sending them flying. Sometimes it may feel pain the day after a collision. Rhyhorn lives in rough terrain. A Rhyhorn appeared in Bulbasaur's Mysterious Garden under the ownership of a Hiker. Ash's Bulbasaurdefeated it in battle. A Rhyhorn owned by Corey was one of the Pokémon that was captured and cloned by Mewtwo in Mewtwo Strikes Back. The Rhyhorn clone was seen again in Mewtwo Returns, having by this point bred a baby Rhyhorn with the clone of Fergus's Nidoqueen. The first Pokémon that Ash and his friends saw at Pinkan Island in In the Pink was a Rhyhorn, which was pink in color. Although initially unaware of the trio, Ash rushed up to it and antagonized it. It then cornered the gang at a cliff-edge, and attempted to charge at them, who were saved by Togepi using Teleport via Metronome, causing Rhyhorn to charge over the cliff. It was then rescued by Ash and friends with the help of the resident Officer Jenny. A Rhyhorn charged at Ash's Donphan after it had angered it by accident in Odd Pokémon Out. Grace has a Rhyhorn which first appeared in Kalos, Where Dreams and Adventures Begin!. It was used in many races when Grace was younger. A Rhyhorn appeared in Diancie and the Cocoon of Destruction. Another Rhyhorn appeared in A Race for Home!, where Serena hijacked it to chase after Team Rocket who stole cheese. Rhyhorn debuted in The Flame Pokémon-athon!, entering a race with its Trainer. Rhyhorn jumped onto a stone but they sank, and Rhyhorn and its Trainer were eliminated from the race. Rhyhorn appeared in the banned episode EP035. Ash attempted to capture it in the Safari Zone, but it got away. 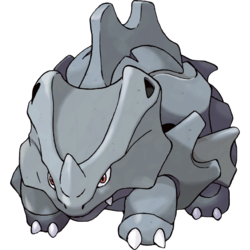 Multiple Rhyhorn were among the Pokémon seen at Professor Oak's Laboratory in Showdown at the Po-ké Corral and The Rivalry Revival. 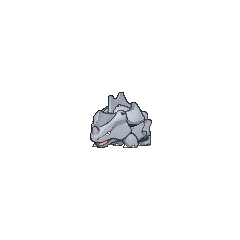 Rhyhorn also appeared in The Power of One. Two Rhyhorn were seen at Professor Oak's Laboratory in A Tent Situation. A Rhyhorn was one of the Pokémon seen at the Pokémon Swap Meet in Tricks of the Trade. A Rhyhorn was seen in the wild in The Legend of Thunder!. Multiple Rhyhorn also appeared in Celebi: Voice of the Forest, Pokémon Heroes: Latios & Latias and Destiny Deoxys. Jon Dickson's Rhyhorn defeated Harrison's Houndoom and knocked Harrison out of the Silver Conference in Johto Photo Finish. A Rhyhorn that belonged to Noland was seen in Numero Uno Articuno. A Rhyhorn was amongst the group of Pokémon used to attack Dawn, Brock, Officer Jenny, and Solana in Pokémon Ranger and the Kidnapped Riolu! Part Two. Multiple Rhyhorn were caught by the Pokémon Pinchers in Pokémon Ranger: Guardian Signs (Part One). A Rhyhorn appeared in the opening scenes of Giratina and the Sky Warrior and Zoroark: Master of Illusions. Multiple Rhyhorn appeared in a fantasy/flashback in A Showcase Debut!. Multiple Rhyhorn appeared in Master Class Choices! where they were used as part of the Theme Performance of the Fleurrh City Pokémon Showcase. EP088 Rhyhorn Ash's Pokédex Rhyhorn, the Spiked Pokémon. Rhyhorn is known for its physical power and its considerable offensive and defensive skills. 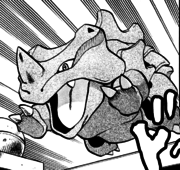 Rhyhorn debuts in the Red, Green & Blue chapter in Raging Rhydon as Koga's Pokémon. After getting defeated by Red's Pikachu, Pika, it's forced to evolve with a mysterious injection, and knocks out Misty with its increased power. In Long Live the Nidoqueen! ?, another Rhyhorn is seen in possession of Giovanni, and is one of his main fighters, who knocked out Red's Aerodactyl with a simple Tail Whip. He also later uses it in the battle with Lance to generate a sandstorm by crushing rocks. In The Last Battle XIII a Rhyhorn was one of the Pokémon sent to help the fight in Ilex Forest. Rhyhorn was one of the rental Pokémon used by Emerald in his Factory challenge. A Rhyhorn appeared in Skirting Around Surskit I as a rental Pokémon that Guile Hideoutstole. A Rhyhorn belonging to Y debuted in An X-cuse to Come Out and Play. It was originally owned by Grace. It often carries X around while he sits inside a tent attached to its back. Much later, Y decides to officially keep Rhyhorn on her team, and nicknames it Rhyrhy.